A double feature! This one courtesy of a dear friend who hates on Priest, but digs on zombies! Feast was chock full of the kind of bloody, sloppy, and gloopy effects that just tickle us pink, so even if its standard Living Dead stuck in a house setup was, well....standard we couldn't help but smile. We really liked it when that Best Week Ever guy oozed maggots and monster puke, and the way that newly-pubescent creature humped that lady's face before being blown to smithereens was truly inspired. Feast also hit us with gratuitiuos Jackson-esque fluid sprayin', hip fourth-wall commentary, and tough actin' talents of Young Guns II's Balthazar Getty and the ever-classy Henry Rollins. In fact, ol' Hank's the only reason we watched this in the first place! We chuckled at his pink sweatpants and wept at his demise. Recommended! And while we're doling out the accolades we'll also recommend this here Cradle of Filth concert. Here at the Highland Cinema we're seriously into the spooky black metal. Our lobby's been blasting the Wolves of the Throne Room, the Mayhem, the Watain, and even the mighty Frost during the many moons of '07 and now that we've upgraded our theater's specs we've decided to screen every concert clip we can get our hands on. So when the of Filth came our way how could we say no? These guys and their corpse-painty Robert Smith style never appealed to us, but it turns out they have many things we do enjoy, specifically things like blastbeats, tremolo pickin's, and glass-shattering screeches! We don't thinks we'll ever get behind their limey Poe-boy shtick, but when the stage spectacle has acrobatic ladies, comin'-to-life gargoyles, and headbanging demon robots we can't help but give 'em the benefit of the doubt. 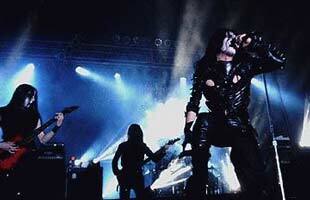 We're also glad the castle lore and lacey vampires didn't scare our guests like that Carpathian Forest concert did. Yeesh.